These crepes can be used in place of large, flat noodles in many recipes, such as primalcotti or lasagna, or in place of tortillas in enchiladas. Thin, delicate crepes made of egg and milk. Whisk the eggs, milk/cream, salt, and pepper in a medium bowl. Heat an 8-inch nonstick skillet over medium-low heat. Brush the skillet with some butter or olive oil. Working quickly, pour 1/4 cup of the egg mixture into the pan, swirling to coat the bottom of the pan evenly. Cover and cook until the egg crepe is just set, about 1 minute. 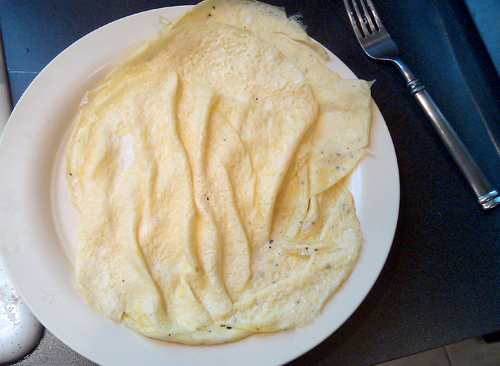 Invert the skillet over a plate, and allow the egg crepe to drop onto the plate. Repeat to make 8-10 crepes total, brushing the skillet with melted butter as needed and stacking crepes on the plate.